Jeff and I have had a rough few weeks, and when times get tough, we turn to comfort food to make it all go away. 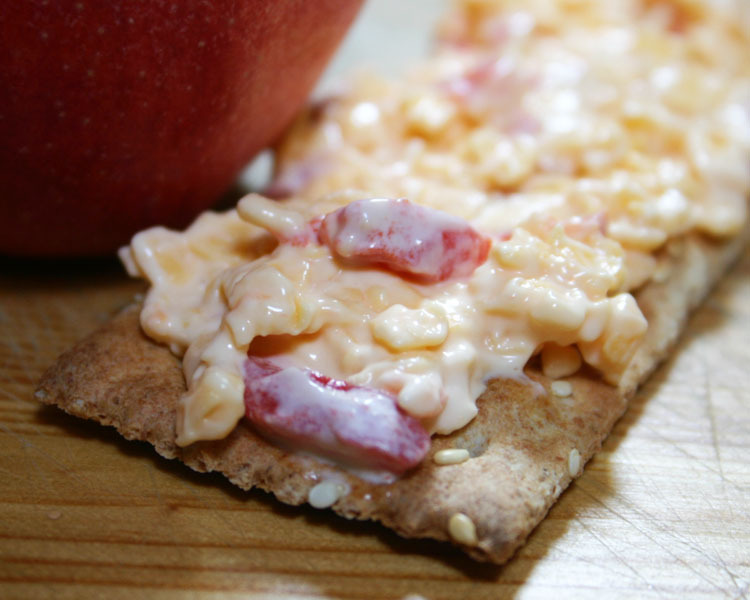 I’ve heard that pimento cheese is an acquired taste, but I have absolutely no idea why since it’s ABSOLUTELY DELICIOUS. On everything. After we’ve spread it on crackers, apple slices, bread and hotdogs, we take it to the next level and use it in our grilled cheese sandwiches, producing the tastiest, gooey-est ones ever. My recipe uses ONLY the key ingredients from every pimento cheese recipe because I really believe less is more when it comes to this southern staple. Mix the grated cheese, pimentos, garlic (if using) and a heaping spoonful of mayo in a bowl. Mix in more mayo, a spoonful at a time until the mixture is spreadable, but not runny. Pop in the fridge for at least 30 minutes before using or noshing! Pingback: Steampunk Optimus Prime, Alfred E. Neuman, Married Folks on the Brink of Divorce, the BEASTS OF THE SOUTHERN WILDS All Like to Procrastinate on This!